Experimente as vistas, sons e sabores da cidade de Quebec nesta temporada de férias em uma excursão gastronômica festiva de 2 horas. Saiba mais sobre a fascinante história e cultura da cidade de Quebec. Passeie pelas ruas - do Petit Champlain até o Mercado de Natal do Old Port Québec Cidade - degustando queijos e carnes, chocolates, doces, cidra de maçã, vinho e muito mais em oito das melhores lojas e restaurantes da região. Todas as taxas de degustação estão incluídas. Reserve um lugar neste tour de férias saboroso hoje. 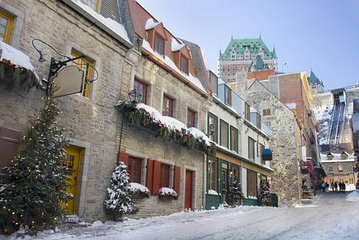 Comece este passeio gastronômico pela cidade de Quebec em Upper Town District, depois caminhe até o bairro de Petit Champlain, uma das áreas comerciais mais antigas da América do Norte, com um ambiente romântico com boutiques e bistrôs exclusivos. As lojas locais e galerias de arte aqui oferecem itens artesanais de artesãos do Québec e do resto do mundo. Apenas a alguns minutos de distância, veja o majestoso hotel Chateau Frontenac, adornado para as férias em todo o seu esplendor, com vista para o rio St. Lawrence. Visite oito lojas locais, restaurantes, boutiques e vinícolas nesta excursão de férias. Compre presentes de Natal exclusivos e experimente alguns dos pratos locais, como queijos e carnes gourmet, chocolates, cidra de maçã, vinho gelado e muito mais. Durante todo o passeio, um guia local experiente irá explicar a história e cultura desta fascinante cidade europeia e apontar a arquitetura única. O passeio termina no movimentado mercado de Natal, perto do Old Port Quebec City. I found this a little too much sell for a food tour. Too many places visited and too short a time in each Place. Yes we were warned it was tasting tour and it certainly was that. OK general information given about the area but just too quick for us. Jocelyn was a wonderful tour guide! She was funny, upbeat and informative. We toured a variety of restaurants and ended up in the Christmas market down by the St. Lawrence River. The only thing I would have changed was the time the tour started. It starts at 2 pm but by the time we finished it was pitch black out and there was a blinding snowstorm. To get to our inn we had to walk up a few steep hills in sub-zero weather. That is one way to burn off some of the calories but unpleasant in the winter. My favorite stops were the chocolate shop and the ice apple wine shops. Jocelyn also gave us some history of the areas we toured which added to my knowledge of the city. I would not have seen these areas had it not been for this tour! The tour guide was very good and the tastings were good too. The hosts at each stop were very informative. The market was nice with lots of local variety. Our family of 4, with 2 adult 'children' took this tour in mid-december. We visited 6 or 7 locations, including the farmer's market and a chocolate shop all served us delicious tastes. There were several locations that we returned to on our own for drinks or snacks later in our trip. However..... 3 of the locations served almost identical hors d'oeuvres and it was too 'sales' focused. The tour guide was very knowledgeable, though we felt a bit like school children, with head counts at every stop. We were first time in Quebec City- what an amazing place! One day before our tour every street was covered in a lot of snow, but nobody was complaining, just waking together 12 people. We fallowed a very professional and nice guide Harry which showed us the best places in the City. We stopped in more than four restaurants to try local food and drinks- delicious! Highly recommended to everyone! This was a GREAT tour. We had samples of delicious food and a taste of Quebec's rich history. Another benefit of going on this tour was that it helped us get our bearings so that we were able to more easily navigate the city streets on our own. That said, the best part of the tour was our guide, Jocelyne, who was exceptionally sweet and energetic. I'd give it more stars for her alone if I could. Great way to tour Quebec and sample in their delicacies. Great tour and fun, walking around the city in a snow storm! Fun for the whole family - kids 13 and 17 enjoyed the experience as much as the adults.